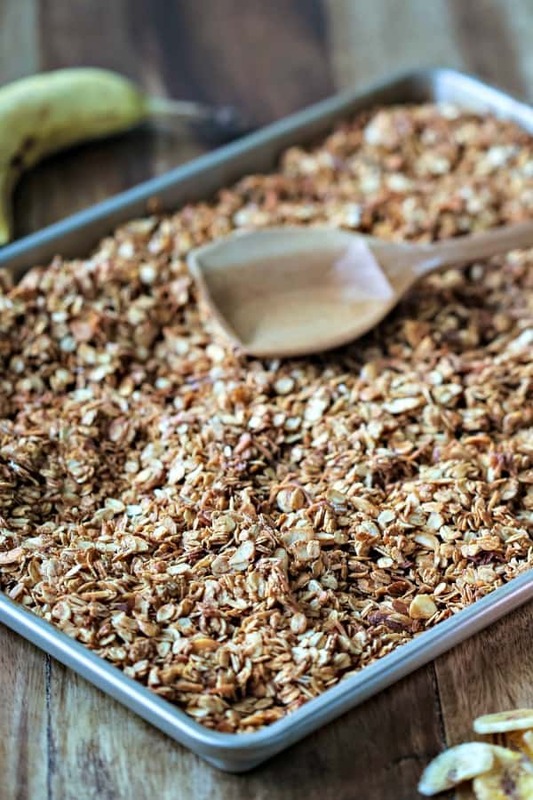 Making homemade granola cereal like this Peanut Butter Banana Granola is much easier than you might think. 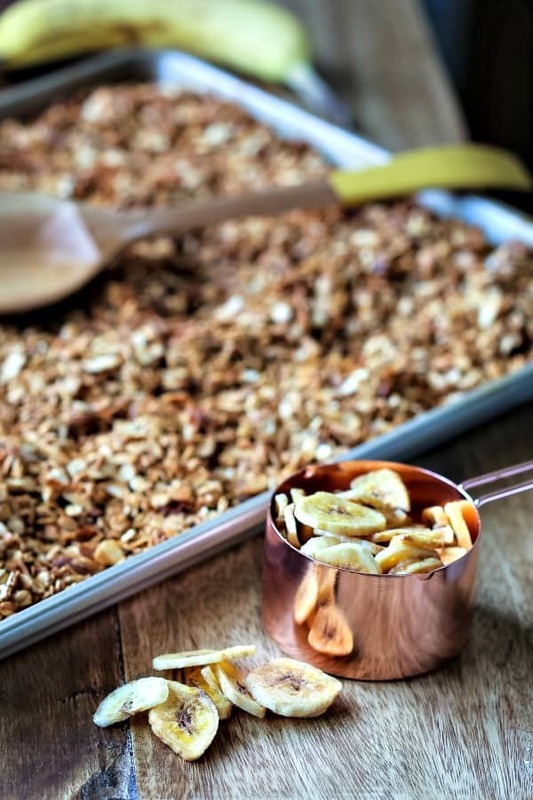 Made with old-fashioned oats, homemade banana peanut butter granola is sweetened with honey and has added crunch from dried banana chips, toasted flaked coconut, and sliced almonds. Bake and keep a batch on hand for a quick, healthy breakfast. 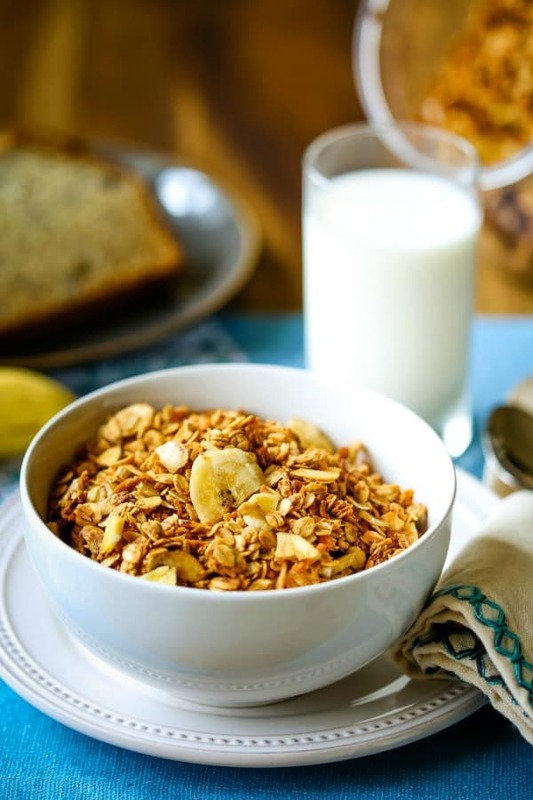 That way you can enjoy a bowl of whole grain granola with milk or serve it as a crunchy topping for fruit and yogurt parfaits. And what’s more, while the granola bakes, your entire house will smell like oatmeal cookies! Let’s talk breakfast for a moment, shall we? How many of you are like me and are guilty of skipping breakfast every now and then, especially when you’re running a few minutes late? I can’t count the times I’ve run out the door without stopping for breakfast only to have my stomach try to eat itself by 10 o’clock! There’s nothing more embarrassing than sitting in a meeting when your stomach starts to rumble and growl. I may not always have time to have a cooked breakfast, but I can certainly take five minutes to have a bowl of granola. 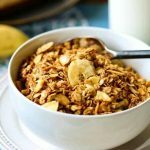 Since I started making this easy homemade granola recipe, fitting breakfast into our morning routine has become simpler and tastier, too! 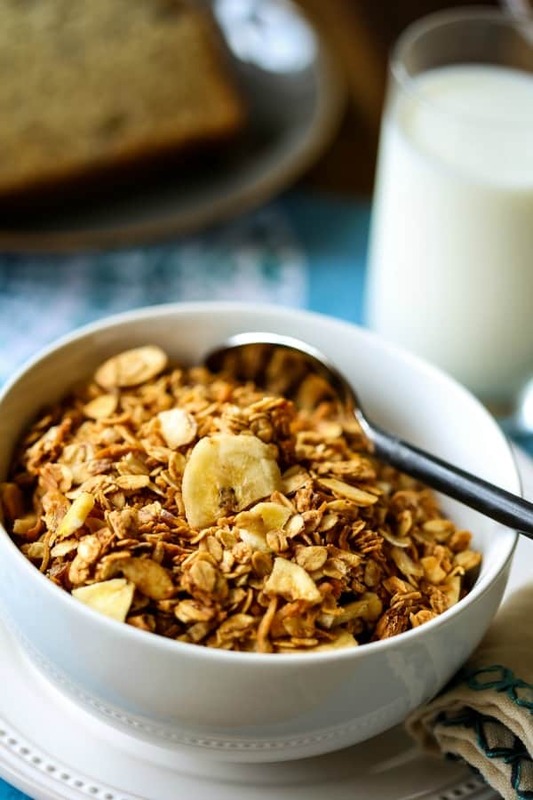 Why make your own granola cereal? Have you noticed that the boxes of cereal on the grocery shelf seem to be getting smaller and smaller? On average, cereal is sold in 12- to 14-ounce packages, which is about 8 servings. Normally, this granola recipe will yield about 16-20 servings. The aroma! Our entire house smells like warm oatmeal cookies, so homey and cozy! That right there is practically worth the effort! Whole grain granola made with peanut butter and honey is all natural and has less sugar! Combine dry ingredients (except for the banana chips) in a large bowl. In a separate bowl, stir together melted butter, peanut butter, and honey until smooth and pour over the oat mixture. Stir until combined, then add egg whites and toss again. Pour the mixture into a rimmed baking sheet and bake for one hour at 275 degrees, stirring every 15 minutes. Every time you open the oven door, be prepared for the delicious smells! You’ll start to have warm fuzzy, cozy feelings! After the baking is complete. add the dried banana chips to the oats. I like to break them up into smaller pieces first. Let the granola cool completely, then place into an air-tight container for storing. Ginger Spice Granola – Sweetened with maple syrup and molasses, this homemade granola will remind you of gingerbread! Blueberry Coconut Oatmeal Pancakes – Added oats and shredded coconut make a heartier pancake without being overly heavy. Peanut Butter Oatmeal Energy Bites – Satisfy your cookie craving with these tasty no-guilt, no-bake energy bites naturally sweetened with honey! Blueberry Oatmeal Muffins – Bursting with fresh berries, these muffins are crowned with a brown sugar streusel crumble for a bakery-style result. 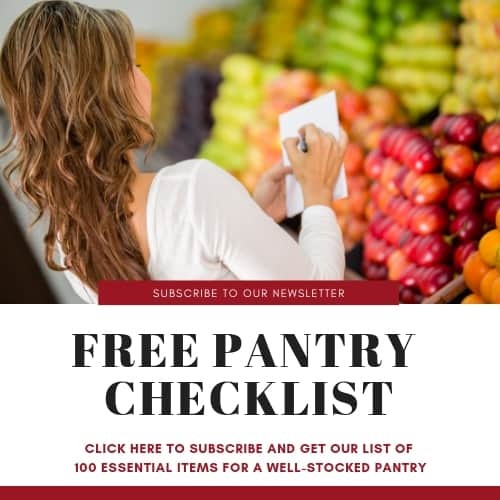 Pumpkin Oat Muffins – These muffins are made with whole wheat flour for a healthier, whole grain muffin sweetened with dark brown sugar and maple syrup. 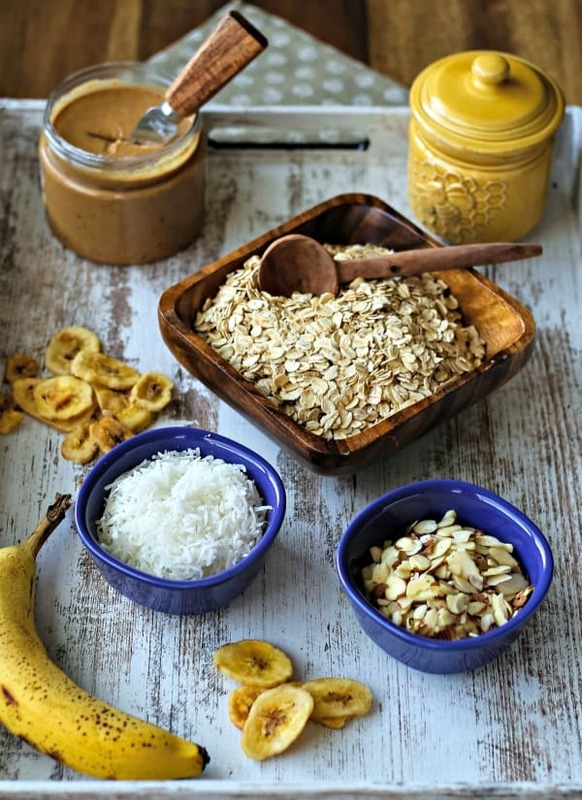 DID YOU MAKE THIS PEANUT BUTTER BANANA GRANOLA RECIPE? Made with old-fashioned oats, homemade banana peanut butter granola is sweetened with honey and has added crunch from dried banana chips. 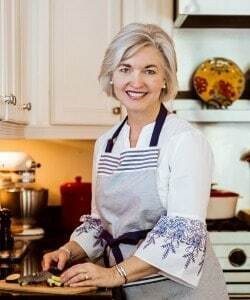 In a large bowl, combine the oats, coconut, almonds, and sea salt. DO NOT add the banana chips at this time. In a small saucepan over medium-low heat, melt together the butter, peanut butter, and honey and stir until smooth. Pour on top of the oats and stir until coated. Whisk the egg whites with a fork and add to the granola mixture, stirring well. 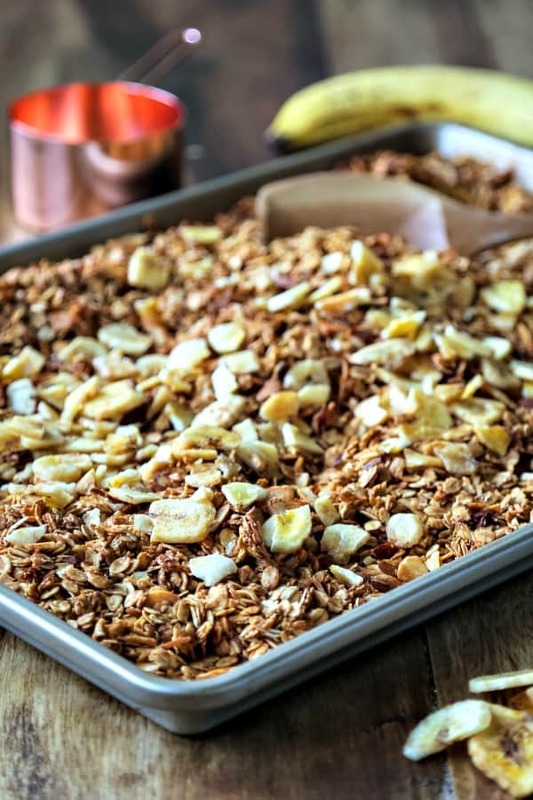 Pour granola into a rimmed baking sheet and spread evenly. Bake for 1 hour, stirring every fifteen minutes. Remove from the oven and let cool. Stir in broken banana chips and store in an airtight container.